T﻿his﻿ ﻿is the 203rd game a﻿ll-time between Buffalo and Carolina; Buffal﻿o has a 102-74-26 series record. I feel the start of a home win streak. 5-2 we win this one. Git’er done Boyz. Sabres have 9 wins since the streak ended, with 6 of those wins coming on home ice. They're also 15-7-3 at home vs 11-13-3 on the road this season. Home should be an advantage. 5 of those against bottom feeders. Also, our road record after the streak is where things really went to hell. They've had 14 road games since the streak and they've only won THREE of them. They had won 8 of 13 road games before and during the streak. Doing some napkin math, I put the Sabres at 87 points if they can't get their ***** together on the road through these last 30 games. Also, most of our road losses have been 1 goal affairs. So it's possible that they could turn it around with a combination of Ullmark getting hot and maybe a little more secondary scoring. 1. Stop no-look passing the puck to the middle of the ice in the defensive zone. 2. Stop no-look drop passing the puck in the neutral zone. 3. Stop no-look passing along the boards in the offensive zone. 1. A team that moves its feet, that pressures the other side, that attacks with speed. 2. A team that plays conservatively and tentatively and allows the other team to set the pace. When the Sabres play like Team 1, they win. When they play like Team 2, they lose. It's that simple. I think some opponents know this and use tactics to disrupt our speed an flow. This is Housley's challenge: To get the team past obstuctionist opposition. EDIT: #1 and #2 and which team the Sabres plays like has been true for a dozen or more years. Even in the depths of the tank they were far more likely to win if they moved their feet, and destined to lose if they didn't. Fair observations. And, of course, they generally play well when they win, and they generally play poorly when they lose. I keep referring to that win streak as magical. And I mean that in a fairly literal way. Lightning in a bottle. Since then, they've played as a bottom-5 team. They're not as good as that 10-game win streak might have suggested. Probably not by a long shot. And they're not as bad as a bottom-5-paced record would suggest. ... I think. I ... hope. I would be giddy at the chance to have 2 home games against the TBL in April. That aside: 90 points or bust. In other words.....use your vision? This is as close to a playoff game as we've gotten in years so we have to play playoff hockey. Let's see if they can. Anyone want my season tix for tonight? Man what a day. Working where my grandfather retired from in 1980, Oxy-chem. Was in awe of the moments as a child I would be in Grandma's car waiting to pick him up from work. Then, came home and was fortunate enough to unwind these past couple of hours as I caught a TV show, with no commercials this time, that I watched as young boy back from 1978, the 1st two episodes of "Battlestar Galactica", the story of a Star World. Just hearing the theme music, seeing Lorne Greene again, so many childhood memories. So much of a GREAT FEELING. I haven't seen it since it was cancelled, it was like seeing it for the 1st time again. The inner child in me came out. The joy, the excitement, yea, that felt great. I feel good about tonight's game, real good. Our boys will show up...…………………..GO SABRES!!!!!!! Was that Woody rocking the McCabe sweater? Have you ever watched the reboot that Sci Fi Channel did in the early 2000s? 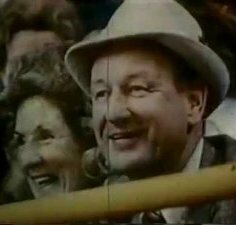 Hopefully you can hear Uncle Miltie in your mind tonight calling six or seven goals. It's incredible that these two teams have almost the exact same record. Unfortunately, I wasn't even aware they made a remake. But for me, the original was just amazing. We covet what we know so they say, and as a child, this was a large part of it for a couple of years. Massive game. This team has a very meaningful game in February, at home, against a team they can beat. I need to see a fantastic effort. It's also a little of what we've been waiting for. I'm excited. What a life we live, eh PA? I can't help it as I fast approach 50 that every little tidbit of childhood and through adolescence comes flooding back to me as things bring those memories back. I feel...…………..I feel like the French Connection, or Danny Gare, or Patty and Alex is going to show up and bring me back to glory. But those young days, of discovery, hope, faith and that feel good internal flame...……………….it's still in me, even now. I feel...………………..I feel young again, if even for this moment. GO EICHEL! GO REINHART! GO RISTO AND PILUT AND DAHLIN! The Moment You Realize It's Dan. I hate to say it but my immediate reaction was this game deserved Rick.